The Fields of Horses barn offers horse boarding facilities for up to 8 horses. All stalls are 12 x 12 oak-lined and rubber matted; five of which have semi-private turnout paddocks. The wash stall has hot & cold water and a heat lamp for year round use. A heated tack room offers feed and equipment storage as well as a washer & dryer. Horses boarding with us have use of paddocks ranging in size from ½ to 3 acres. All paddocks have oak board fencing on the perimeters and Centaur 3-rail vinyl on the interior for ultimate equine safety. For exercise we have a grass jump area and access to many miles of trails available for hacking. Hook-ups are also available for trailers with living quarters. 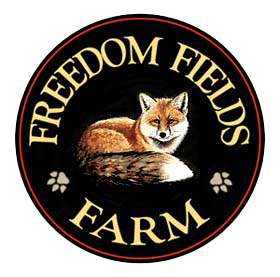 Riders who choose to stay with their horses at Freedom Fields Farm have a choice of three in-house bedrooms in the main house or a private studio barn apartment with full bath and kitchenette. The main house has one queen bedroom with en-suite full bathroom, one full bedroom with attached shared full bath, and one full bedroom sharing the neighboring bathroom. The owners reside in the downstairs bedroom. House amenities include an open downstairs floor plan, free wifi, full breakfast, wrap around back porch facing west to the Blue Ridge Mountains and pastures, 6 person hot tub, and front patio overlooking the barn. © 2018 Fields of Horses. All Rights Reserved.